The Stanley FatMax Fine Finish Saw features a bi-material handle that's screwed and ultrasonically welded for comfort and security. The teeth are precision set to generate clearance of kerf for the blade to cut on both the forward and back stroke increasing cutting efficiency by 30%. 3 sided precision ground teeth offer razor sharp cutting edges at every stage of the stroke. The saws induction hardened teeth stay sharper for twice as long as ordinary saws. 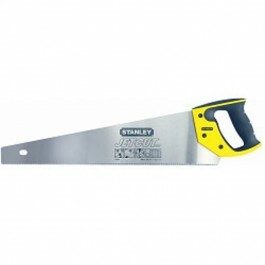 Stanley FatMax Fine Finish Saw also available in 500mm length.